USMAN Khawaja has opened up about the enormous personal toll his brother's arrest took on him this summer as he celebrated an emotional century in Canberra. The star batsman hasn't looked himself over the past couple of months and on Sunday the suffering experienced by the committed family man was laid bare as he paid tribute to wife, Rachel, for the support she has given him during one of the toughest experiences of his life. 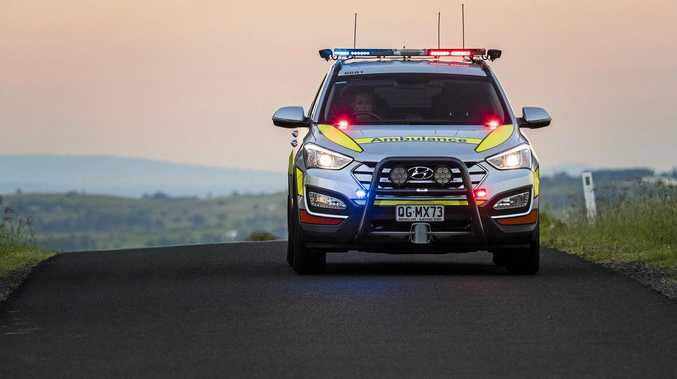 Khawaja's brother Arsalan was charged over an alleged fake terrorism plot back in early December and was re-arrested at the end of that same month for breaching his bail conditions. Test great Shane Warne had called on selectors to drop both Khawaja and Mitchell Starc for the final Test against Sri Lanka, but both of Australia's twin engines fired back to life and guaranteed their places in the Ashes squad later this year. Starc bowled with frightening pace on his way to a 10th career five-wicket haul, and Khawaja smashed an unbeaten 101 to register the eighth century of his Test career. Australia is looking the world in the eye again and could even leapfrog England on the Test rankings with Sri Lanka's demise only a matter of time after a dominant declaration left the tourists 0-17 and needing a virtually impossible 498-runs to win. Mitchell Starc was back to his best. 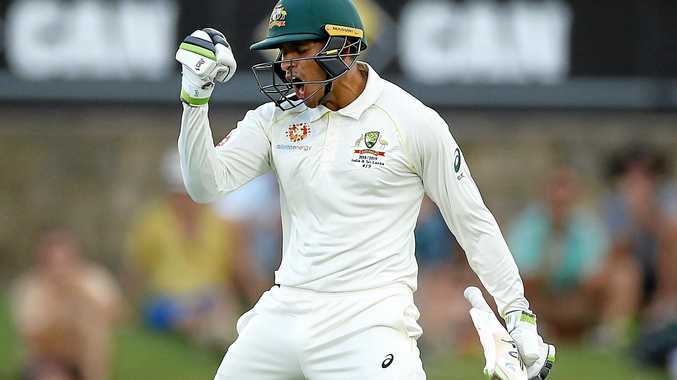 After averaging 20 over the first five Tests of the summer, Khawaja declared the only pressure he felt was from within as he thanked his wife for helping him cope with his family's sadness. "While I was playing cricket, you forget about everything. By the same token it's very taxing and it has been very taxing mentally. That's why I say Rach has been great, being around and trying to take my mind off things. "I'm feeling a lot better now than I was a month or two ago, but it's been a tough couple of months. "(Rachel) has been awesome, just to have her around and to go and travel with me, she's been my rock throughout the whole thing." 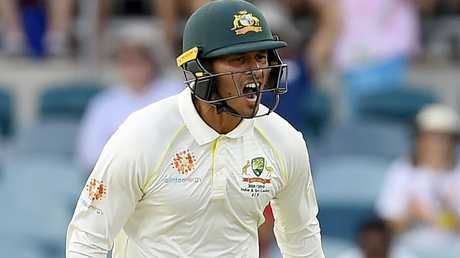 Australian captain Tim Paine allowed Khawaja to get his hundred before declaring a mammoth 515 ahead in a Test match that has effectively become a no-contest with two days still to play. However, nothing could change the fact that Khawaja was under enormous personal pressure coming into his final innings of the summer. The veteran left-hander showed exactly what it meant to him as he celebrated his eighth Test century with an emotion-charged salute. "It wasn't fun getting a duck first innings and feeling like you let your team down a little bit," he said. Khawaja's sense of humour also returned as the stump microphones picked up his cheeky exchange with Sri Lankan keeper, Niroshan Dickwella, who tried to sledge him. The flourishing form revival in Canberra might have come on the last weekend of the summer against a battling opposition, but it still counts. England are in the midst of a shocking away loss to the West Indies and the best they can be heading into the Ashes now is to be on level-footing with Australia. Starc - who went wicketless in the second innings in Brisbane last week - has copped more criticism than any Australian player this summer but responded in Canberra like a man on a mission. 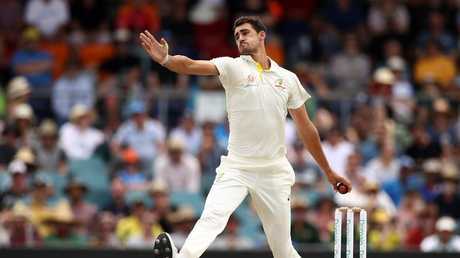 By his own admission, he's no automatic selection for the first Test of the Ashes, but Starc's sizzling 150km/h pace onslaught against Sri Lanka was the hallmark of a competitor who had dug deep. "The one for me this week was just to run in and bowl fast. Wickets are a wonderful thing," Starc said. "They help everything as well. I found a bit of swing there today."